Cure Forward is a patient activation company providing people diagnosed cancer with an access to their individual molecular profiling test results from certified diagnostics labs, and giving them tools to put that data to productive use by connecting patients to specific and relevant information, clinical trials, physicians and other similar patients. At the beginning of cooperation, N-iX dedicated team was dealing with a small amount of work mainly focusing on adding functional to pre-designed pages mockups. After a successful start, our team was extended from 2 to 20 people. Currently it is working on a full-stack development for a series of Cure Forward web-services, covering both client-side and back-end development. In September, the team launched Cure Forward’s online medicine platform, in public beta. Cure Forward is a US-based biotech startup aimed at changing traditional approach to cancer treatment. The idea of Cure Forward came up when Martin Naley realized that most of the patients, diagnosed with life-altering diseases such as cancer, have no one to address their questions and are hopelessly searching the Internet for available information and clinic trials. After 15 years in biotech industry, Martin had an established connections with many cancer researchers, clinicians, and people who make gene-sequencing technologies, so he decided to change traditional approach to cancer treatment by combining the technology, medical advances, and connectivity. Cure Forward is a network that seeks to connect patients who are keen to try experimental treatments for their cancer with researchers who may be looking for subjects with their genetic pathology. The site also aims to connect patients with each other. At the core of the service is a “trial exchange” — an eBay-style forum where patients can host the genomic data about their cancer. 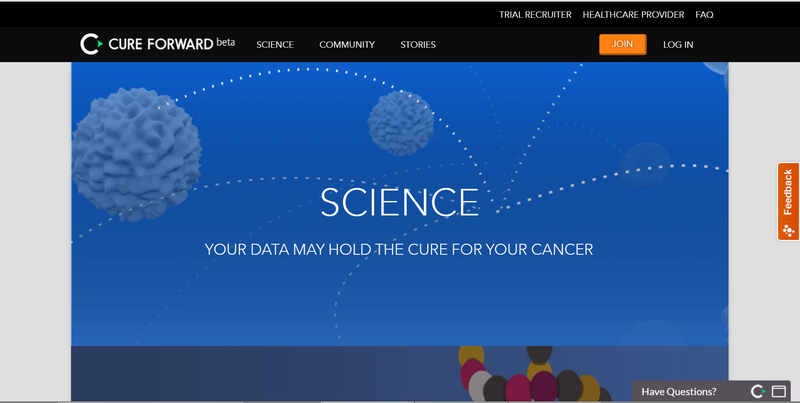 Researchers of leading clinical trials can browse the postings looking for a match. The service is free for patients and physicians, but Cure Forward will charge trial recruiters a fee when they enroll subjects. Cure Forward also has an educational component. When a patient’s cancer is sequenced, they’re typically handed a set of letters and numbers that represent the genetic mutations responsible for their disease which makes little sense for them. To help patients better understand their genomic data, the website will also host a collection of narratives that explore the story of individual mutations known to be associated with cancer. In September 2015, Cure Forward successfully launched its online precision medicine platform which has received $15 million funding from Apple Tree Ventures earlier that year.